This glorious designer cocktail ring by LeVian is fashioned from solid 18k rose gold. Over 200 round brilliant diamonds pave the gallery, shoulders, and halo surrounding one of the most remarkable oval cut tanzanite gemstones we've ever seen. Weighing over 14 carats, this deep bluish-violet tanzanite stone performs with phenomenal light return. This is a rare and beautiful find, a tanzanite of such stunning clarity and size. Tanzanite is a member of the zoisite family. Zoisite is a fairly obscure gemstone family consisting of several species of stones formed from silicates of calcium and aluminum. This yellow-brown stone acquired its name in 1805, when geologist Baron Sigmund Zois von Edelstein found it in Austria. It would be several centuries before anyone took any marketing notice of the zoisite family. That notice came with the discovery in 1967, in Tanzania near the eastern shores of Africa. A prospector named Manuel d'Souza was hunting for sapphires in the northeastern portion of the country. Careful to make connections with the local tribesman, he finally hit the jackpot when a group of Masai natives guided him to the Merelani Hills, a stone's throw from Mount Kilimanjaro. The purple-blue stones he found there had been circulating among the tribes for centuries. The Masai herders found the crystals scattered across the ground after lightning set a grassy field on fire, transforming the local brown zoisite into this mesmerizing new blue stone. Since then, the women of the tribe wore beads made from the beautiful stones, particularly after giving birth. At first, d'Souza thought these stones were a variation of the blue sapphires he'd been hunting. But later testing proved them to be a rare and unusual form of zoisite. Three years later, in 1970, Tiffany & Co. acquired the lion's share of marketable blue zoisite. Jeweler Henry Platt, working for Tiffany at the time, coined a new name for the beautiful stone: Tanzanite. 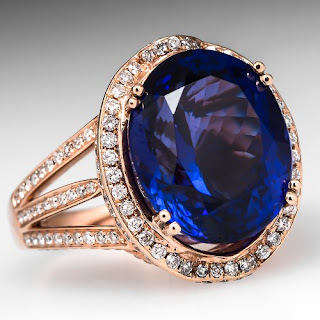 For a number of years, Tanzanite enjoyed high fame. Tiffany's jewelers had a grand time fashioning gorgeous contemporary pieces from the lovely blue stone. Crystal healers and mystics attached much in the way of significance to the newly discovered gemstone. Their beauty is thought to stir the mind toward communion with the heart, increasing compassion, spiritual insight, and connection to divine love. Tanzanite is thought to be a self-actualizing stone. As such, it is purported to aid a person in discovering their true calling. It is believed to illuminate one's motives and purposes, aiding the soul-searcher to discover the reasons behind the choices they've made. Tanzanite is believed to vibrate at an accelerated rate, infusing its wearer with joy, happiness, and relief from anxiety. It is said to allow access to the heart's wisdom, allowing one to evaluate the ideas of an activated mind with the wisdom of the ancients. It is advisable to wear a tanzanite ring, pendant, or bracelet when you're facing significant life changes, such as a change in career. It is also recommended when facing communication difficulties, whether business or personal, and also when facing what seem to be insurmountable problems or obstacles. Since Tanzanite is the birthstone of December, it is believed that these positive attributes of the gemstone will be enhanced for those whose birthdays fall in that final month of the year. If you would like to feel the essence and power of Tanzanite for yourself, we invite you to make an appointment to meet with us in our Bellevue area showroom.